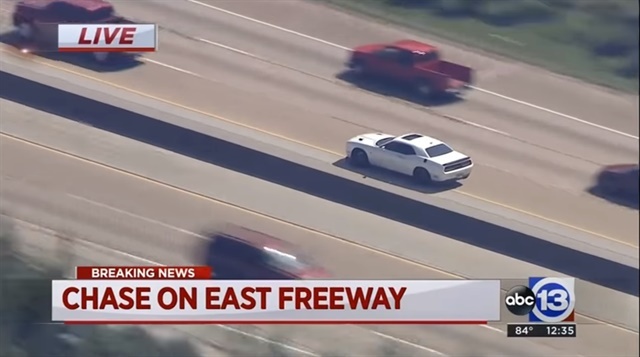 It's often said that suspects involved in police pursuits can't outrun the police because of radios and air support, but a suspect driving a reportedly stolen 707 horsepower Dodge Challenger Hellcat tried to do just that last week in Texas. Weaving in and out of lanes and riding on the shoulder to avoid other vehicles, the Hellcat reached speeds of well over 100 mph during the pursuit, which began in Houston and ended in Jefferson County. The suspect Mohamed Abu-Shlieba abandoned the car and attempted to run away from police on foot through a field. Officers think it was because he ran out of gas. Not long after that, he was apprehended by local law enforcement, Jalopnik.com reports.